For the past few years, the only types of Christmas gifts I would give to my wife were gift certificates to spas or have a massage therapist come over to our home and untangle the stress from Madelene's aching body. In the past, I used to give her beautiful jewelry - everything from tennis bracelets to diamond crosses, but much to my surprise, she’s into a more simplified type of jewelry, where I can’t possibly rush off by myself and pick it out for her. She likes custom designed jewelry. Usually, that means trekking over to Sugar Loaf, NY where we have a few friends who make their jewelry right on location. It’s always a fun trip, but for some reason, I just wanted to get her something different this year. Then it dawned on me. 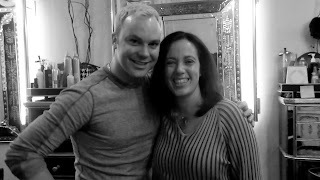 One Monday night while watching The A-List New York on LOGO, one of the cast members who happens to be our favorite of the bunch owns his own salon. They would show Ryan Nickulas dazzling up a model and working his magic into her hair for a photo shoot. I thought to myself, “Hrmmm, wouldn’t it be nice if I could just get in touch with Ryan to have him do Madelene’s hair...?” Since Madelene has been dying to get her hair done, I had this crazy idea but wasn't sure how to pull it off. Questions started floating through my mind: is this show “real”, because a producer friend of mine from Granada who owns the network would tell me that 40% of all reality shows are mostly scripted. Is there really a salon in the West Village or is this a set? I’m sure many people have asked this question while watching the show. So on a whim, I took it upon myself to check Ryan out on Twitter. On Twitter, all your communication is even more public than facebook. I then tweeted him: “My wife needs you to do her hair. Any chance I can get her in?” Within an hour or so, I got a tweet back saying, “Call me!” And, I did. I got an appointment with Ryan himself for the following week. So, needless to say, an early Christmas gift for Madelene. As soon as we walked in, we were greeted by TJ and Ryan, taking off our coats and offering us coffee. They were incredible hosts. Madelene got washed up and headed over to Ryan’s chair. 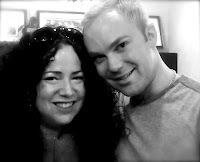 As we got to know one another, it was amazing how much Madelene and I had in common with Ryan and his husband Desmond. We all go to the same vacation spots, we were all legally married in Provincetown, MA in the month of October no less, and the dynamics of both our relationships are very similar. Ryan noticed that “I was him” in the relationship, as Madelene was “my Desmond”. Ryan and I are both affiliated with similar charity organizations that helps out homeless gay teens. He’s involved with The Ali Forney Center, as I am with OUT 2 Connect as a columnist. It seriously felt like we already knew them - not from just watching the show - but we saw ourselves in them. As we spoke even further, we then began to notice even more similarities, as far as our interests and tastes in many things in life. I felt like I met my brothers for the first time. I never felt so at home before in a salon as I did with them. Ryan did Madelene’s hair so beautifully, she was glowing all evening. Jokingly, I said, “Yeah, great. Now that she has this beautiful model-like hair, she’s gonna start tanning, working out and then leave me for someone else - that’s how it always happens.” They all chuckled, but she was beautiful before she even stepped in. Ryan just enhanced it, making her look like even more of a supermodel. My eyes were fixated all evening. As he snipped away and blew her hair straight, I filmed a little part of it because it was so entertaining. He described what products he was applying and the techniques he was using so that Madelene can go home and try to mimic what he had done. While Madelene was getting her hair done, cute little TJ shuffled over right next to me and started giving me a complimentary manicure. The entire salon was engaged in the same conversation. It was like we all somehow knew one other. We had so much fun just sitting there, hanging out chitchatting with our two favorite boys from The A-List NY. With that being said, Ryan has agreed to be apart of my documentary, Gays & Lesbians of Faith, to speak about his opinion regarding ‘religious’ people who condemn homosexuals. We spoke about it at length and we may be filming this either in his New York apartment or in his salon. I always leave the location up to the person I am interviewing so they’re more comfortable being in their own environment. Overall, our experience going to New York, meeting Ryan and TJ and getting to know them on a more personal level was better than I had ever expected. 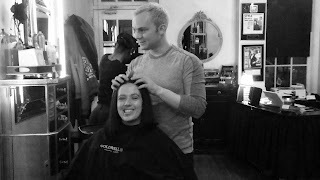 If you want the best cut, style or manicure, please check out the Ryan Darius Salon in the West Village. Make an appointment. And don't worry if Ryan's not available, all of his other stylists are trained to do the same cuts and styles as Ryan does it. 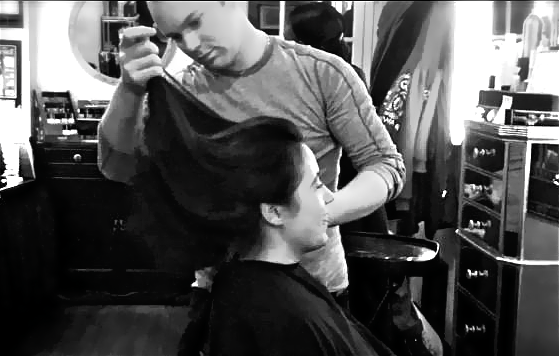 Here's the video of my beautiful wife getting her hair done by the beautiful Ryan Nickulas. A big thanks to Ryan who worked his magic & made us feel at home and a special thank you to TJ who gave me excellent manicure. What incredible guys.